Tires and treads pick up a lot of mud, rocks and sediment on a construction site. Unfortunately, this means they can track it onto streets and roads when they leave. Not only does this create a mess, but many communities also have laws prohibiting track out from job sites. This is where contractors can benefit from a construction track out solution such as the OUTRAK™ track out mats from YAK MAT. Keep reading to learn more about this useful and important new product. OUTRAK™ removes mud and sediment from vehicle and equipment tires as they leave your project site. Your equipment can make a clean exit using our new track out mats. These mats ensure that roads will be kept free from gravel, stones and other debris that could be left by your trucks and other machinery. This eliminates fines and penalties that can be incurred when tracking debris from project sites onto highways and streets. Track out mats also help prevent accidents and damage to other vehicles that can be caused by rocks and sand being kicked up by drivers. They install over asphalt, turf, sand, grass and mud — even on uneven ground. What Is a Stabilized Construction Entrance (SCE)? A stabilized construction entrance measures 12 feet wide by 70 feet long of appropriate aggregate. The area where the SCE is to be located needs to be excavated 6 inches down in depth, a geotextile erosion control fabric placed down, with aggregate placed on top. Individual jurisdictions have required specifications that can increase or decrease in depth, width, length, size of aggregate, etc. After SCE removal, topsoil must be added back to the disturbed area, graded and re-seeded. OUTRAK™ is an innovative and convenient new construction track out solution that solves a major problem associated with our environment. It also benefits job sites by effectively removing mud and sediment from vehicle tires. Whenever a vehicle needs to enter a paved road from an unpaved site, OUTRAK™ is your answer. The design features numerous pyramid-like protrusions that create an elevated surface over which vehicles cross as they leave the site. As they do, heavy mud and rocks have an opportunity to fall off the tires or treads. The mat can be hosed clean easily, ensuring that nothing is carried off the site. Our mat size is 12 feet wide by 7 feet long. 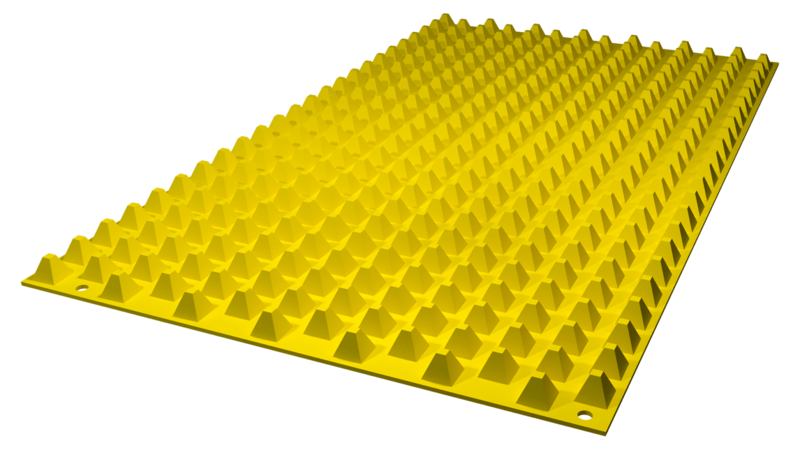 Ten mats make a system for a standard 12-foot-by-70-foot entrance used on most constructions sites. Various jurisdictions require different lengths, so this may be more or less depending on where they will be used. OUTRAK™ mats weigh approximately 430 pounds, and can be anchored to the ground as well as anchored together. We are a recognized leader in access mats and other job site solutions. To learn more about OUTRAK™, any of our other access mat products, or to place your order, contact us today. WHAT IS A STABILIZED CONSTRUCTION ENTRANCE (SCE) ? A Stabilized Construction Entrance measures 12’ wide by 70’ long of appropriate aggregate. The area where the SCE is to be located needs to be excavated 6” down in depth, a geotextile erosion control fabric placed down, with aggregate placed on top. Individual jurisdictions have required specifications that can increase or decrease in depth, width, length, size of aggregate, and similar. After SCE removal, topsoil must be added back to the disturbed area, graded, and re-seeded. OUTRAK™ is an innovative and convenient new track out mat solution which solves a major problem associated with our environment, and benefits job sites by effectively removing mud and sediment from vehicle tires. Whenever a vehicle needs to enter a paved road from an unpaved site, OUTRAK™ is your answer! Our mat size is 12’ wide by 7’ long. Ten mats make a system for a standard 12′ x 70′ entrance used on most constructions sites. Various jurisdictions require different lengths so this may be more or less depending on where they will be used. OUTRAK™ mats weigh approx. 430lbs, and can be anchored to the ground as well as anchored together.